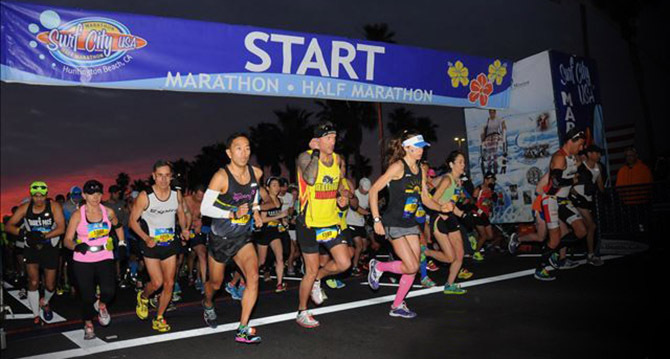 The Surf City USA Marathon and Half-Marathon attracts more than 20,000 runners from around the world. The exclusive oceanfront course runs along the Pacific Coast Highway (which is more like a street than a highway in this area), past the Huntington Beach Pier and the famous Southern California surfing beaches. Weekend highlights include many Super Bowl parties, the three-day Active Lifestyle Beach Expo and finish line beach party, and the Michelob Ultra Beer Garden. Surf, sun, and run the longest stretch of uninterrupted beachfront anywhere on the West Coast. This spectacular ocean front course is an exclusive Southern California favorite! 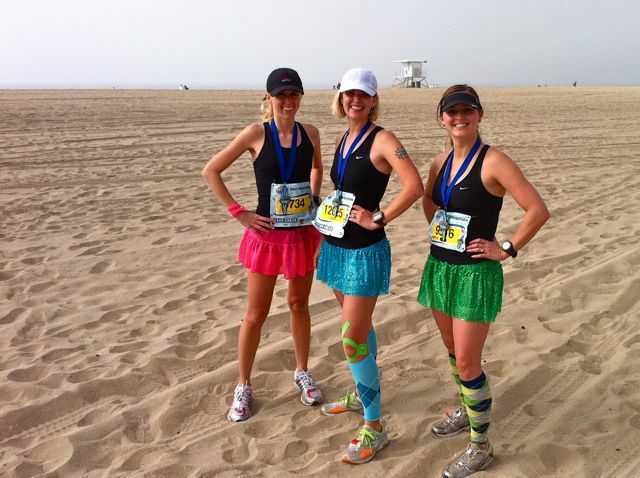 Run by the famous Huntington Beach pier and continue through scenic Huntington Central Park. Observe native surfers in their natural habitat as you hit the beachfront running path at Bolsa Chica State Beach. – Wheelchair Start Time 6:28 a.m.
– Clif Pace Groups available. Pace times can be found on our Faq page. – Aid Stations include Water and Nuun electrolyte. Please see our Faq page for Clif shot zone locations and Aid Station details. Start on Pacific Coast Highway between the ocean and the Hilton Waterfront Beach Hotel. Running north, the Huntington Beach Pier and Main Street are less than a mile away. Look to the left to enjoy the famous Huntington Beach Pier. 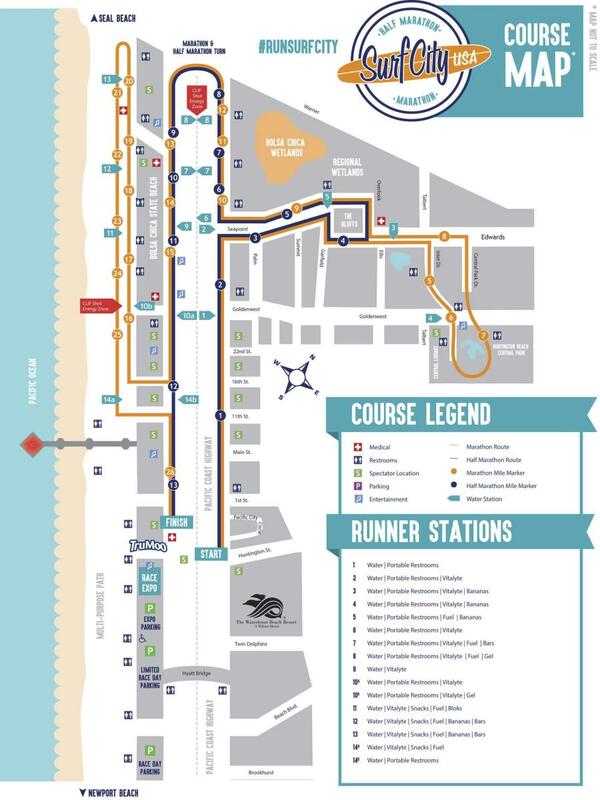 The next time you see it, you will be on the beachfront running path at mile 25! Just past the second-mile marker, at the first retro surf band station, turn inland on Seapoint and head for Huntington Central Park. On this stretch, you will encounter the course’s only incline, between miles 3 and 4. But take heart; there are hundreds of kids at the park, waiting to cheer you on! They love marathon runners and get up early every year to come to the park, hand out water and yell words of encouragement! These will be your biggest fans!Feeding off energy from the kids in the park, head down Seapoint back toward the ocean. Enjoy the ocean view all the way down to PCH. Just past mile nine, take a right on PCH and absorb the energy from the ocean! Breathe in the fresh sea air as you continue north on the highway. The Bolsa Chica Reserve wetlands roll out to the right. This 300-acre ecological wonder is a sanctuary for wildlife and migratory birds. Bolsa Chica, along with the rest of Huntington Beach, CA, has some of the nation’s best birding! Nearly half of the birds found in the U.S. have been seen in Huntington Beach. Sightings of great blue herons, snowy egrets and brown pelicans are common; lucky bird watchers can even spot a rare white pelican at the right time of the year. Starting on mile sixteen, the course leaves Pacific Coast Highway and continues on a beachfront running path paved right over the sand! These are the same beaches where the legends of surf movies and music were made. Observe local surfers in their natural habitat with the waves crashing just yards away. Run all the way back to the pier, where a crowd of spectators will be cheering from above! After turning at the pier, work your way up through the lifeguard station back to Pacific Coast Highway. As you come on to the highway, you will be less than a mile from the finish line. It’s a straight shot from there, and the finish line banner is just ahead. Spectators line the highway to cheer you to the finish line! 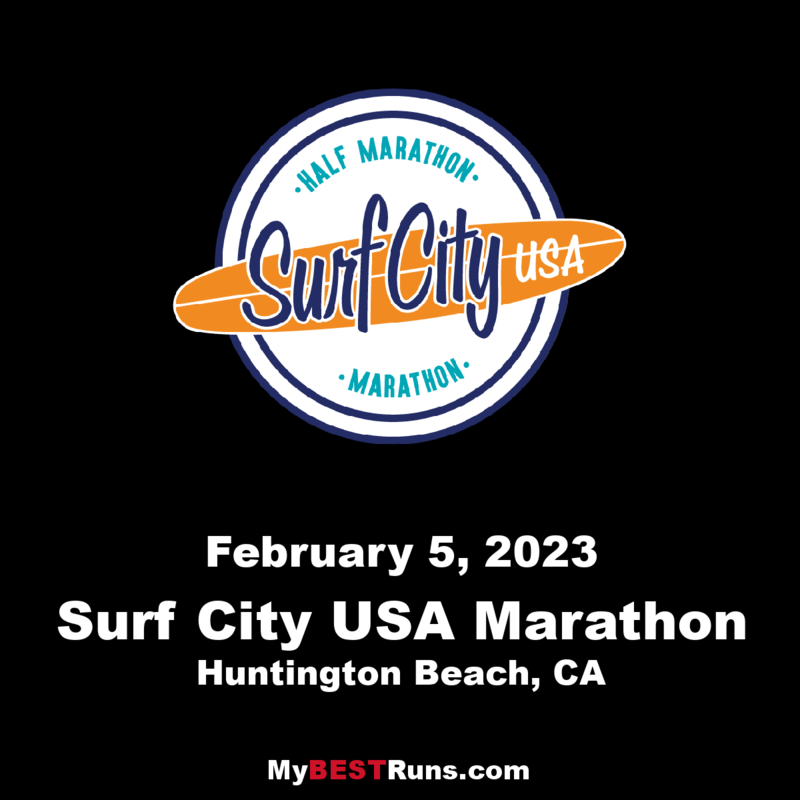 About eight miles of the marathon course runs on the multi-purpose beachfront running path that winds through the legendary surfing beaches of Southern California. This public path is not part of the closed course and you may encounter walkers, bicyclists, and others who are not participating in the race. It is only 8 feet wide in some places, which is why we limit the marathon event to 2,000 participants. Special Note to Wheelchair Athletes: We request wheelchair participants select our Half Marathon course. Wheelchair participants will be the first to start on Sunday at 6:28 AM. If you are an adaptive athlete and would like further information please email us atrunsurfcity@motivsports.com.We will be happy to assist you.